Mary Lou Georgic, age 89, of Butler, passed away on Friday, February 1, 2019 while under the care of Sunnyview Nursing and Rehabilitation Center in Butler. Born March 15, 1929 in Allison Park, she was the daughter of the late Twite W. Geisler and Louise Maute Geisler. Mary Lou was a member of the Meridian Presbyterian Church and a former member of the Covenant United Presbyterian Church. She enjoyed quilting, sewing and needlepoint. Caring for her family was her greatest joy, in particular, her beloved granddaughters. She will be dearly missed and fondly remembered. Mary Lou leaves behind to cherish her memory her son, Randall S. Georgic and his wife, Victoria of Butler; her two grandchildren, Erin Cardamone and her husband, Michael, and Andrea Georgic and her husband, Matthew Salyers; her sisters, Patricia Geisler Yates of Florida and Dorothy Geisler Abbott of Butler; and her sister-in-law, Patricia Georgic Clinton of Mars. In addition to her parents, Mary Lou was preceded in death by her husband, whom she married on February 5, 1949, Norman J. Georgic Sr., who passed away on May, 26, 1996; her son, Norman J. Georgic Jr.; her two brothers, William Geisler and Dean Geisler; and her sister, Georgetta Geisler Swaney. Friends will be received from 2-4 P.M. and 6-8 P.M. on Monday, February 4, 2019 at the Boylan Funeral Home & Cremation Center of Connoquenessing Twp., 856 Evans City Rd., Renfrew, PA 16053. A funeral service to celebrate Mary Lou’s life will be held at the funeral home at 11 A.M. on Tuesday, February 5, 2019 with Rev. Steven Franklin, officiating. Mary Lou will be laid to rest at the North Side Cemetery in Butler. Memorial donations may be made in Mary Lou’s honor to Meridian Presbyterian Church Memorial Fund, 4150 Highland Ave., Meridian, PA 16001 or Connoquenessing Meals on Wheels, c/o White Oak Springs Presbyterian Church, 102 Shannon Rd., Renfrew, PA 16053. To send flowers or a remembrance gift to the family of Mary Lou Georgic, please visit our Tribute Store. 1002 N. Main St. Ext. 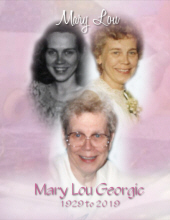 "Email Address" would like to share the life celebration of Mary Lou Georgic. Click on the "link" to go to share a favorite memory or leave a condolence message for the family.